“Don’t hit my something with your nothing.” Some of my fathers favored words were “Don’t hit my something with your nothing.” In our family, you always had to have an alternate idea if you were going to complain about plans or disagree with someone’s opinions. A few years back I realized the power of that simple phrase. I pulled it out, dusted it off, and it has become the motto of our aggressive drive for innovation. I had the pleasure of interviewing Tammy Cohen, a screening industry pioneer with nearly three decades of experience in the background check world. Founder and Chief Visionary Officer of InfoMart, the 7th largest identity and background screening company in the industry, Tammy is known professionally as the Queen of Screen and was named among “Atlanta’s Top 20 Women-Owned Firms” and “Top 500 Women-Owned Businesses in the US.” Her drive has modernized hiring and given her clients a competitive edge when recruiting top talent. I had a unique childhood. My father was a multi-millionaire — an entrepreneur, a banker, a real-estate mogul — but in actuality, he was a modern-day conman. My stepfather, by contrast, was mild-mannered, funny, and a struggling entrepreneur. Because of the two of them, I was exposed to all sides of entrepreneurism. My father was always wheeling “deals,” and my stepfather was just trying to keep the doors open. Even though I could see into both worlds, I was primarily raised by my stepfather. He was a motivational presence and always on hand to provide advice and guidance. One of the chores assigned to me was mowing our lawn; I quickly noticed that other girls in the neighborhood didn’t have to mow their laws, a fact that I quickly brought to my stepfather’s attention. This was the first time I remember him telling me there was nothing a boy could do that I couldn’t do, and he’d continue to tell me that for years to come. I continued to be the only girl in my neighborhood mowing the family lawn. Months later, when class elections started at school, my stepfather found out I wasn’t running because “only the boys run for class President.” He jumped into immediate action. We stayed up all night. The next morning, I boarded the bus with an armful of campaign posters — and I won. As a teenager, I caught the entrepreneurial spirit from my father and stepfather, and when I was in my mid-20s I became obsessed with starting a background check company. It started when I was an administrative assistant on a small team of all men. We completed a significant project, and out of appreciation, the client gave everyone on the team handguns (yes, in the ’80s, southern high-end swag was firearms). But I didn’t get my gun; the VP gave it to his brother-in-law instead. So, I quit. They offered to buy me an even nicer firearm, but at that point, I was determined to stick to my principles. I know it was an irrational reaction just to quit, but when I look back it was one of the greatest decisions I ever made. More than 15 years ago, I began a crusade. I believed that one day people would own and control their identity and personal data. I believed that social security numbers would become a relic, and we would have one unique global identity number. The idea was met with smirks. It was the time of the great data grab, which in many ways still exists. Everyone wanted to own and control the most data. Those silent smirks were saying, why would you want to put the individual the data is about in control? It went against the founding tenets of doing a background check, and the technology of the day couldn’t sufficiently support such a paradigm. 15 years later, InfoMart is the first to begin the journey that grants candidates control and ownership of their personal data. We recently launched the industry’s first self-sovereign platform for background checks; the platform allows applicants to certify the accuracy of results and decide which entities to release the information to. We were also first-to-market with a platform that captures and verifies biometrics using facial recognition, and now we are taking our industry-first innovations and marrying them with the blockchain. This disruption will cause a ripple effect in our entire industry. InfoMart and all our competitors will have a new service model that will impact the verification, storage, and security of static data. No matter your position, your experience, or your situation, there are always people to learn from. You can find guidance and opportunity at every turn if you are willing to receive it, so — from our receptionist to our CEO — I am learning more every day. Thirty years ago, it was an oddity for a twenty-five-year-old to start a business. In the early days, when InfoMart was a struggling small business, the women in the Cobb County community took me under their wing. They helped InfoMart get its start through their incredible support, both individually and as a collective. These women, who run the gamut of professions and industries, took a young, insecure girl and helped turn her into the confident community and business leader I am today. Bronwyn O’Dell, an executive at the local chamber of commerce, taught me public relations, gave me my first invitation to sit on a local committee, and introduced me to every business person in our community. Lynda Coker, a state representative, taught me to advocate. She worked diligently to grant me the same opportunities in our state as those given to the much larger public companies by whom I was surrounded. Babe Atkins-Byrne took a chance on me and gave me multiple opportunities to lead — first as the chair of a newsletter committee for a local women’s association and eventually as the chair of one of our community’s most significant events, the American Cancer Society’s Swordsman’s Ball. The community of women in Cobb County took me under their wing. They opened the doors of opportunity to me. They advised me at every turn, from strategic business moves to picking my battles wisely to the basics and brutal truths of what not to wear. As I shared earlier, I have been thinking about all the ways for this paradigm shift to occur. I have two shelves full of sketchbooks filled with ideas aimed at inventing an entirely new world of data. Backed by our biometric ID authentication, InfoMart is well on its way. 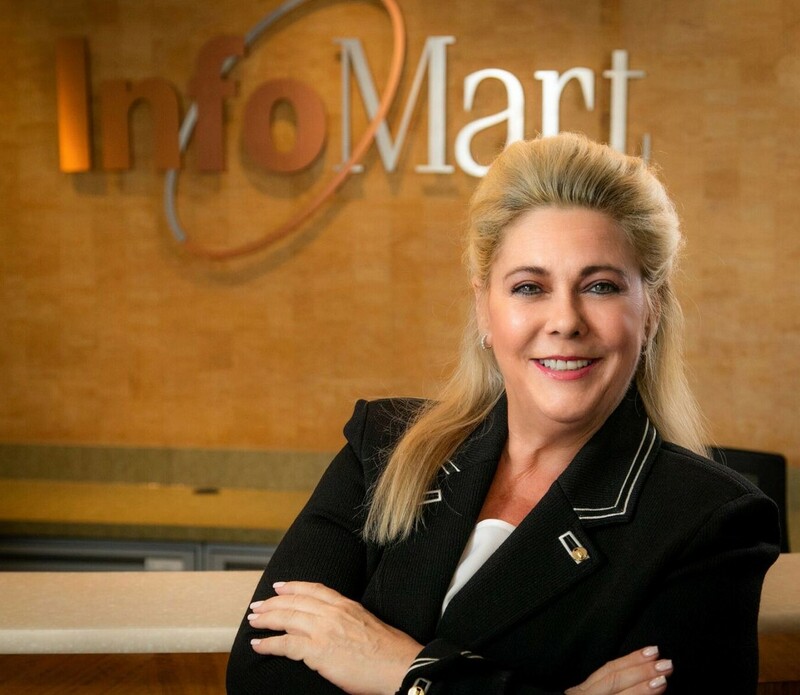 It’s an exciting time in the world of information, so it’s an exciting time at InfoMart, too. Launching phase one of our self-sovereign platform is unique to the industry and creating a lot of buzz. Currently, we are in the midst of discovering and conceptualizing our blockchain initiative. Once that is complete, our next phase is exciting, unique, and a first in the data world…but you will have to catch back up with me in January. Right now, it is top secret. “Betting on the right horses.” In the first year of business, I read a magazine article titled “Betting on the Right Horses.” I framed and hung it on the wall directly across from my desk, where it was always in my line of sight. The success of InfoMart is based on hiring the right people. That same article still hangs on my wall. “You have achieved. You have greater responsibility.” Dr. Betty Siegel was the first woman to lead a University in Georgia; she still holds the record for the longest-serving female president of a public university in the nation. When she asked me to chair a workforce development committee, I told her that I didn’t have a college degree and wasn’t sure if I had the skills to lead the committee. She said, “You have achieved. You have a greater responsibility.” She went on to add that all she wants from her students is achievement, not a diploma. She explained that with success comes the responsibility of my community and my employees. It’s another way of saying “to whom much is given, much is expected.” I never realized that I had this huge responsibility to not just give back but to care for and be responsible for my community and employees. I collect rare books, and a 1921 first edition of The Go-Getter was in a lot of books I acquired. The book is about a man who most people would never have given an opportunity to. He persuades the founder of a company to take a chance on him with an assignment. He goes all in — catching planes and trains, pawning his possessions, and doing everything he can to benefit the company. Due to his initiative, ingenuity, and productivity, he excels against the odds. Moreover, he becomes the Chair of the company. Every year, InfoMart gives out “Go-Getter” awards to employees that display this same enthusiasm and commitment. Madonna. She’s the greatest marketer of my generation. She’s innovative. She’s fearless. She driven. She’s cultivated a personal brand that’s adapted as the times change but always stayed true to her core. She works in an in-the-moment industry, but decades after her ‘moment’ in pop culture, she still ranked as the highest paid celebrity of the year. I would love to sit down and ask her for five off-the-cuff ideas to market InfoMart. Find me at @ByTammyCohen on Twitter and TammyCohenPHR on LinkedIn. You can always find more information about InfoMart at www.InfoMart-USA.com.